Colonial nations are a unique form of subject state available to any colonial power and can form in the Americas and Oceania. They are not playable without the Conquest of Paradise DLC. Colonial regions in the new world (America and Oceania). The New World and Oceania are divided into several ‘colonial regions’ for the purpose of forming colonial nations. Colonial nations form if five cored overseas provinces exist in a single colonial region. The formation will occur regardless of the cores' status (territorial or state). After the formation, all provinces gained (by the mother nation) within the same colonial region will be transferred to that colonial nation. Colonies started by the mother country will remain under its control until completion. As most colonial regions contain many more than five provinces, it is possible for multiple colonial nations - from different colonizing countries - to form in the same colonial region. A colonial power may have multiple colonial nations under its rule. They do not use up diplomatic relation slots. A nation can have multiple colonial nations operating in the same colonial region by fully annexing or inheriting countries which themselves have colonial subjects. Iroquois (in North America) colonize Brazil (in South America), the colonized land will remain under direct Iroquois control. There are twelve colonial regions in the game, eleven in the Americas (7 in North America, 4 in South America) and one covering Australia and New Zealand. The following table lists the colonial regions in the game and their most important trade influencing provinces (those with modifiers such as estuaries, inland centers of trade and important natural harbors). Spain with a shade of yellow (color of the Colonial Mexico region) on the right. When a colonial nation is formed, the flag used to represent the nation is generated by dimidiating the motherland's flag with a solid strip of colour. This colour varies, depends on the colour of the colonial region of the colonial nation. 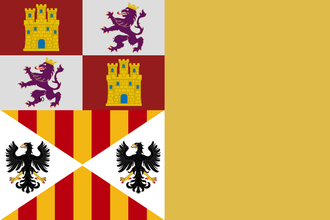 If the motherland's flag changes (e.g., if the motherland is Castile, and Castile forms Spain or if the overlord is annexed), the colony's flag will change as well. Most of the colonial nations have names based on the overlord, however, some have historically relevant names. The table below lists all possible names. The colonial overlord receives tariffs from their colonial subjects. These tariffs are calculated on the basis of the total income of the colonial nation. The colonial overlord receives the full amount of tariffs while the colonial nation only loses 50% of the amount. Decrease tariffs options in the subject interaction interface, for a cost of administrative power. There are also regular events that present an option to raise tariffs for a particular colonial nation at the expense of some liberty desire. This is generally the preferred, although slower method for managing tariff levels as it will not cost any administrative monarch power. liberty desire of a colonial nation is increased by 1% per percentage point tariff rate. Disloyal colonies will refrain from paying any tariffs at all, independent from how high the tariff rate actually is. Global tariffs modifier of the overlord will increase the tariff efficiency and thus the value of the tariffs collected from its colonial subjects, at no additional cost to those colonial nations. There are also several colonial-associated events that can have positive and negative effects on the global tariff efficiency. Interaction with a colonial nation is done through the Subject Interaction section of the Subject Menu. In addition to the regular interaction types, colonial subjects have some special interactions focusing on managing tariffs and colonial management. liberty desire ranging from 0 to 100. The main influences on liberty desire are the colony's development, relations, and relative military strength. Some factors that are specifically relevant to determining the liberty desire of a colony are the tariff rate and the overlord's mercantilism. Something to keep in mind is that when determining relative strength, colonies will only consider their own strength and the strength of independence supporters, not that of other subjects of the same overlord. As long as the liberty desire is below 50%, the colonial nation is unable to declare independence, and foreign nations cannot support its independence. Two disloyal colonies may form an alliance with each other, enabling them to call each other into an independence war. Colonial nations will automatically acquire ownership of any province in its designated colonial region of which its overlord has taken ownership. The overlord does not need to have a core on these provinces for this transfer of ownership to occur. This automatic transfer of province ownership makes colonial nations an important tool for expansion by conquest in the New World, as the overlord merely needs to acquire ownership of provinces in a peace deal, and may then leave the colonial nation to deal with the associated coring costs and overextension penalties. Colonial nations can be granted provinces that are bordering it via land or are adjacent to the same sea zone. If the overlord had cores in these provinces, the colonial nation will instead gain this core, removing the core of the overlord. When colonial nations have enough income to sustain a working colonist, they will automatically colonize uncolonized land adjacent to them. The first catholic nation to found a colonial nation in a colonial region (and with 0 or more opinion of the Papal State) will get a claim on that entire region. The claim can be transferred by annexing the claimant as a catholic nation. The claim will give a +10 bonus to settler growth for colonizing in that region, while other Catholic nations suffer a -20 penalty to settler growth and a stacking -50 relations penalty with the Papal States and the claimant country. Nations with other religions are unaffected by any Treaty of Tordesillas claims. Colonial nations can form alliances with and declare war on any nations with their capital in one of the colonial regions. The alliance is restricted to neighbors only. A colonial nation can declare war on colonial subjects of another nation unless the overlords were allied. Unlike most vassal types, the overlord is not automatically involved in these wars. The overlord can however try to enforce a peace settlement on the power that is threatening the subject colony. If the target of this request refuses, then the conflict will escalate to a war between the two overlord countries. A colonial nation is unable to declare war on any state not in the colonial regions on its own. If a regular established country declares war on a colonial nation, the colony is treated like an ally or vassal and the overlord is automatically called into the war. Colonies will also automatically join all wars their overlords are in. A colonial nation's war for independence will call on any foreign allies that had pledged to support its freedom. administrative technology (except a bureaucratic despotism). Several formable nations exist for former colonial countries; it may form one when the war is over. However, a colony that loses such a war keeps the tariff level at where the overlord set it before the conflict, and the Colonial Nation’s desire for liberty will be lowered by 15-25 points after the defeat, depending on whether the player chooses to kill or spare the colonial leader. It will then slowly climb back (by the default 1% per year) to the default level for a given tariff rate. If the colony has already declared an independence war, it will be treated as successful. The colony will become independent, likely changing to a new tag in the process. If the colony has not declared independence, however, control will be transferred to whoever gained control of the former overlord's capital. This is worth keeping in mind when considering hostilities with colonial empires, as well as when negotiating peace. A colonial nation cannot establish colonies outside its colonial region unless it borders the target province directly by land. Colonial nations provide their overlord with 50% of their trade power. Each colonial nation increases their overlord's naval force limit by 10. Each colonial nation of more than 10 provinces increases their overlord's land force limit by 5. Each colonial nation of at least 10 provinces increases their overlord's global trade power by 5%. Each colonial nation of at least 10 provinces provides their overlord with an extra merchant. El Dorado is enabled, if a colonial nation has gold producing provinces, every once in a while it will send a treasure fleet, providing the overlord with a large sum of money (and inflation), but only as long as the overlord's home trade port is downstream from the colony's. This section may contain outdated information that is inaccurate for the current version of the game. The last version it was verified as up to date for was timeless. While colonial nations function the same on an RNW map there are some issues to keep in mind if following a colonization strategy in a different new world. The number of colonial nation regions may be wildly different from the 11 found in North and South America, ranging from as low as 2 to as high as 18, plus Australia. This can drastically alter a player's strategy if they rely on the force limit contributions of subject nations, or on extra merchants from colonial nations of ten provinces or more. While the standard map does not completely align colonial nations with trade node areas, in a random new world, nothing can be taken for granted. Most trade nodes will line up with a single colonial region, but some will be shattered among several and others may encompass two or three. Founding the right colonies first, in order to control the key trade nodes in a random new world requires a fresh look each game, complicated by the fact that until everything is discovered, there can never be certainty about where the truly crucial areas lie, which is exactly how it was intended to be. In some RNW maps, especially those with large numbers of colonial regions, there are two common peculiarities. First, some provinces will not belong to any colonial nation area, and thus will stay with the first colonizer even after the colony is completed. Second, some areas become a patchwork of colonial regions, none of which are five or more provinces in size, so these colonial nations can never form and thus like the first category will stay with the original colonizer. Both areas should be prioritized as they effectively add directly to the home nation size and bring proper culture and religion provinces that can be made into states without fear of them 'defecting' to a colonial nation. Some colonial regions may be truly huge, and the colonial nations formed in them may attain great size and power, making them harder to keep under control than anything found on the standard map. While this is not a recommendation to avoid colonizing them, stay aware of their growth and consider taking steps to appease them and keep their liberty desire in check, steps that might not be required for smaller colonial nations. The tag that makes it playable to be a colonial nation is 'C00', followed by 'C01', 'C02', 'C03' and so on, from the order that they were formed and from the game's starting overlord.